How Reliable is TripAdvisor for Honeymoon Planning? Any savvy person knows that travel websites based mostly on user-generated content need to be taken with a grain… okay, maybe a huge pile of salt. With these types of websites, anyone can pretty much post anything, good or bad, online for the rest of the world to read. This means that competitors can unabashedly badmouth each other’s businesses, and friends of business owners can post unsubstantiated raving reviews. In short, it’s no secret that these websites can be unreliable. 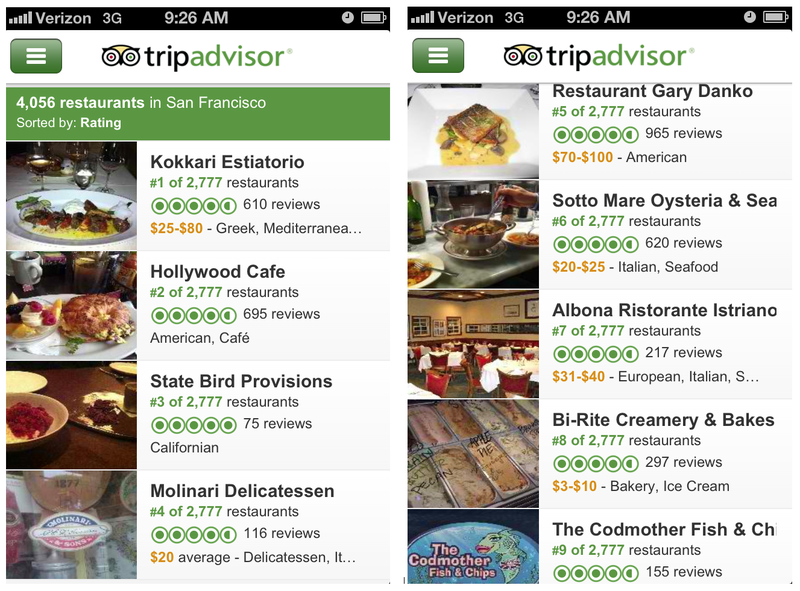 That being said, there’s a lot of potential value to websites such as TripAdvisor, assuming that there are also plenty of honest people out there who are willing to publish their unbiased opinions about hotels, restaurants, and things to do. But weeding out the legitimate reviews from the phony ones can sometimes be hard to do, so it the unreliability even worth it? You need to actually read the reviews, don’t just rely on the number of stars/dots/mustaches*/whatever. Don’t trust the reviews with awful grammatical or spelling errors. If a review seems too good to be true, it probably is. If a review is uncharacteristically angry, the reviewer is probably crazy. If the reviews for a particular hotel/restaurant/thing to do are all over the place, it’s probably best to skip it. The smaller the city or town, the more accurate the reviews will be. So as The Guardian recently put it, you essentially need to “develop a set of personal idiot filters” when looking at review websites and planning your honeymoon. When researching a trip as important as your honeymoon, it’s best to cross reference reviews from multiple sources: friends with firsthand experience, travel books, and websites. Then after your honeymoon you can “pay it forward,” so to speak, by writing an accurate review of your own. * My favorite burrito-reviewing website scores burritos by number of mustaches, not stars. Kokkari has excellent Mediterranean food, but I wouldn’t say that it’s the very best restaurant in all of SF. State Bird Provisions IS what I would argue to be best restaurant in the city. It’s pretty much impossible to get a reservation, but it’s so worth it. Restaurant Gary Danko is a wonderful restaurant for celebrating special occasions. Bi-Rite Creamery is a must for any SF tourist. The line can be outrageous, but you can either go to the soft serve window to try the daily two flavors, or you can go across the street to the Bi-Rite market and get a pre-packed pint to-go. Well hmmmm… I’m just starting to plan our honeymoon to Nicaragua and I’ve been reading a TON of TripAdvisor reviews. I would like to think that most of them are pretty honest, but I think some people are just grumpy and would give any place a terrible review. A lot of it also depends on the person… some people want an “off the beaten path adventure honeymoon” that still includes some luxury, as in a fancy hotel with a pool… and other people would call that “too touristy” and want to completely rough it with the locals. Either way, I don’t know what people did without internet reviews, because even though you have to sort through them and take them for what their worth, they are still so helpful! I totally agree, Amber. Because online reviews are so subjective, the trick is to find reviewers who seem like they have the same expectations and preferences as you. Best of luck planning your honeymoon to Nicaragua, and I hope you’ll consider writing a post for this blog when you get back! I’d love to hear all about the trip because my husband and I are hoping to go there soon, too.